As the recession worsens, more and more Americans must turn to welfare to make ends meet. Once inside the agency, the newly jobless will face a bureaucracy that has undergone massive change since the advent of welfare reform in 1996. A behind-the-scenes look at bureaucracy’s human face, The New Welfare Bureaucrats is a compelling study of welfare officers and how they navigate the increasingly tangled political and emotional terrain of their jobs. Celeste Watkins-Hayes here reveals how welfare reform engendered a shift in focus for caseworkers from simply providing monetary aid to the much more complex process of helping recipients find work. Now both more intimately involved in their clients’ lives and wielding greater power over their well-being, welfare officers’ racial, class, and professional identities have become increasingly important factors in their work. 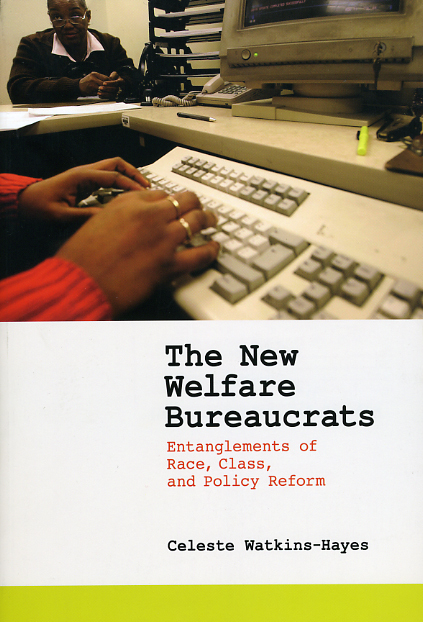 Based on the author’s extensive fieldwork in two very different communities in the northeast, The New Welfare Bureaucrats is a boon to anyone looking to understand the impact of the institutional and policy changes wrought by welfare reform as well as the subtle social dynamics that shape the way welfare is meted out at the individual level. Introduction: Do Street-Level Bureaucracies Matter in a Post-Welfare Era? "Through participant observation, interviews, and archival research, Watkins-Hayes insightfully illustrates the complex ways in which social locations influence the professional identities of welfare caseworkers and how these identities, situated in an organizational, institutional, social, political, and economic context, shape caseworker discretion in service delivery to welfare clients. . . . Overall, the book is well written and engaging. Valuable reading for graduate students, academics, and policy makers interested in creating organizational change."